Definitively inspired by car racing, the new automatic super-chronograph from SAINT HONORE puts the Le Mans spirit on your wrist. Created for performance, it is first and foremost an exceptional measuring instrument. The chronograph times become clear and admired through skilfully architected reading. The silver-tinted dial, in a honeycomb caseback, appears in a clear and racey composition, just like the dashboard in a racing car - round, graduated counters, brightly-coloured hands - or tachymetric scale graduated up to 407 km/h, symbolic figure of the maximum speed record never achieved during a 24 Hours race. The outsized orange figure 15 recalls the start time for the mythical 24 Hours races: 15 hours (3 p.m.). The Haussman Forty 7-24 hides its finest asset inside its titanium finish case - the automatic Valjoux 7750 chronograph movement, visible through a transparent crystal. 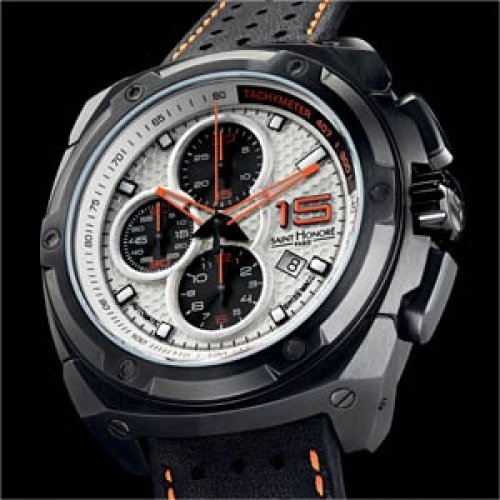 The brand’s two racing-driver ambassadors, Stéphane Sarrazin, for Peugeot, and Christophe Tinseau, for Pescarolo, were wearing SAINT HONORE’s new “machine” , the Haussman Forty7-24, when it made its debut at the Spa 1,000 in advance of one of the year’s major events, the Le Mans 24 Hours. 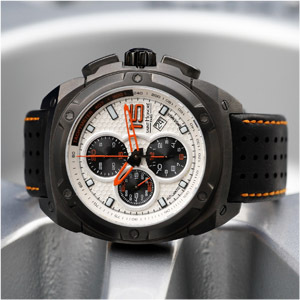 What better work-out for this exceptional watch!